I’m quite a bit late, reporting these, and for the most part, all of these trails have been reviewed here before, but I figured I’d give a quick rundown of a couple loops. Sidewinder. Ride up Sidewinder and turn right on Trail 4. Three Bears. Cross the creek and take a right at the intersection to continue downhill on Three Bears. Take a right onto Bucktail Trail. 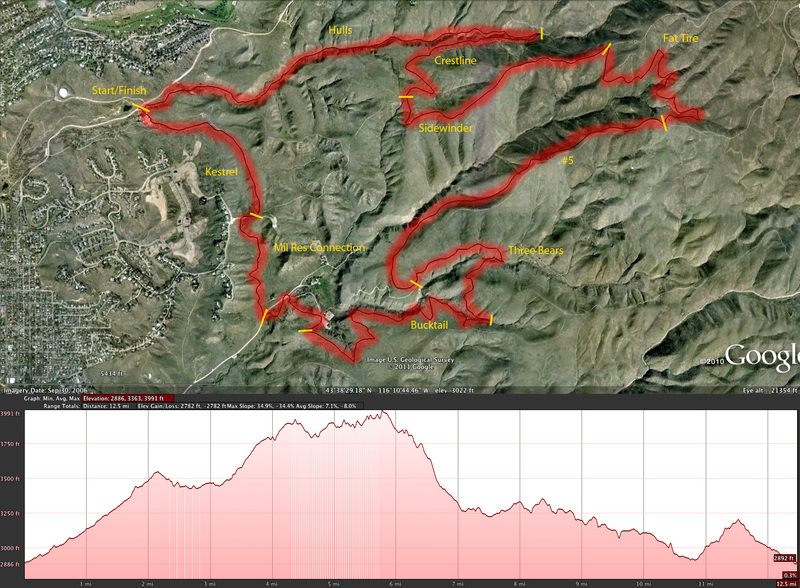 Turn right/downhill onto Ridge Crest, then left onto Mountain Cove. Get off Mountain Cove and hop the road to get on Military Reserve Connection. Head down Kestrel and drive home happy! Sidewinder (#24): This is a fun uphill because it’s a bit tough, but very distracting. What I hate about road biking and dirt roads is that there isn’t much to distract my brain. So, what’s nice about Sidewinder, is that even though it’s got some steepness to it, it’s windy and fun enough that you can forget about the climbing more easily. The first 1/3 or so isn’t bad at all. The last 2/3 is where the steepness starts to kick in, but there are a couple downhill sections that provide for a nice (albeit brief) recovery. The climb is not technical, but it can be taxing if you’re not much for climbing. Three Bears: I didn’t include a link here because on this loop you won’t be on three bears for long. Once you get off of trail #5 you’ll be at a dirt road. Turn left on the road and follow it until you see a single track and a sign indicating trail #26. Turn right onto the single track, go down a hill and cross the creek, then start climbing up towards the main body of the military reserve. You’ll come to an intersection where you can turn left (uphill) or stay straight and start heading downhill. You want to stay straight here (unless you’re looking for extra length and hill, in which case turn left then ride Shane’s Loop back to Bucktail). Enjoy this bit of downhill. It’s short, but it’s windy and fun. There are a couple corners you’ll need to really watch out for uphill traffic on, but otherwise you can make quick work of it. You’ll soon (too soon) start riding along a fence line, then come to an intersection. You’ll want to take a hard right onto Bucktail here. Overall this loop is a lot of fun. You can punch it hard if you want a good workout, or you can doddle a little and just have a good time. I did it with a 10mph average pace, and wished I was going farther when I got to the end (should have gone faster). The only difference is that I started this loop at Camel’s Back park (the actual park that’s kind of at the end of Hill Road) parking lot. Riding from the parking lot to 8th street, I took Kestrel up, grabbed the Military Reserve Connection, crossed onto Mountain Cove, then did everything in the above link (with the addition of following Mil Res Connection, Kestrel, 8th St, etc., back to the car). So, it turned the loop into a lollipop. The addition of a little bit of Camel’s Back may not seem like much, but it really did make the ride a bit more fun. Going from Three Bears to Watchmen is pretty tiring, so adding the Mil Res Connection to the end of the ride was a bonus challenge. I think the near future will see a few extra trails added as well! The total miles from the parking lot and back was 21.33. Trail Conditions (4/20/11): Awesome! Perfect! Excellent! They weren’t wet at all except for two puddles that I can remember, and they were small. It’s starting to feel like mountain biking season! ~ by cardwelc on April 21, 2011.